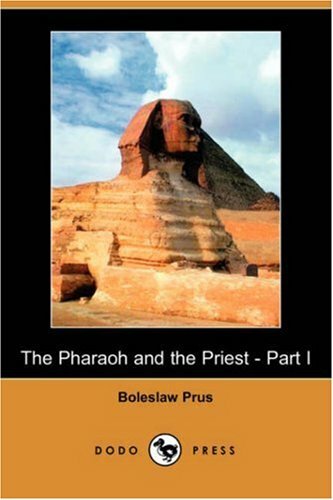 Amazon.com description: Product Description: Boleslaw Prus (1847-1912), born Aleksander Glowacki, was a Polish journalist and novelist known especially for his novels The Doll and The Pharaoh and the Priest (1902). An indelible mark was left on Prus by his experiences as a 15- year-old soldier in the 1863 Uprising, in which he suffered severe battle contusions, followed by imprisonment. At age 25, in Warsaw, he settled a journalistic career that helped prepare his compatriots to be competitive in a modern world increasingly dominated by science and technology. As a sideline, in an effort to appeal to Poles through their aesthetic sensibilities, he began writing short stories. Achieving success with the short stories, he completed four major novels on great societal questions. Perennial favorites with his countrymen are The Doll and The Pharaoh and the Priest. The Doll describes the romantic infatuation of a man of action who is frustrated by the backwardness of his society. The Pharaoh and the Priest, is a study of political power; and while reflecting the Polish national experience of the previous century, it also offers a unique vision of ancient Egypt at the fall of its 20th Dynasty and New Kingdom. About: This collection of literature attempts to compile many of the classic, timeless works that have stood the test of time and offer them at a reduced, affordable price, in an attractive volume so that everyone can enjoy them. About: Boleslaw Prus (1847-1912), born Aleksander Glowacki, was a Polish journalist and novelist known especially for his novels The Doll (1890) and The Pharaoh and the Priest (1897). About: Boleslaw Prus (1847-1912), born Aleksander Glowacki, was a Polish journalist and novelist known especially for his novels The Doll and The Pharaoh and the Priest (1902).